Welcome shoppers! 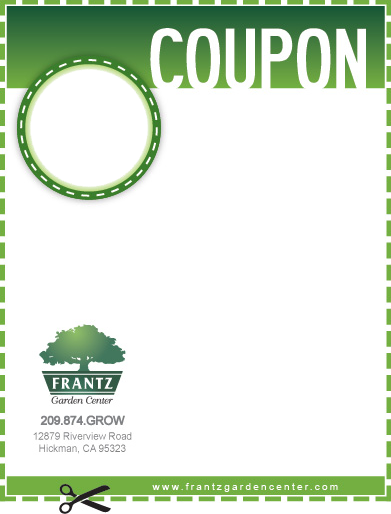 Here is a complete listing of current coupon codes and promotions at Frantz Garden Center. Must present coupon. No cash value. While supplies last. One coupon per customer. Valid on 4/12/19 and 4/13/19 only. Bearberry Cotoneaster (Cotoneaster d. ‘Lowfast’), Japanese Garden Juniper (Juniperus procumbens ‘Nana’), Creeping Myoporum (Myoporum parvifolium ‘Putah Creek). Moonshine Yarrow (Achillea millefolium ‘Moonshine’), Beard Tongue (Penstemon ‘Firebird’), Santa Barbara Mexican Bush Sage (Salvia l. ‘Santa Barbara’). Must present printed coupon. No cash value. While supplies last. One coupon per customer. Cannot be combined with any other offer or discount. Must present coupon. No cash value. While supplies last. One coupon per customer. Cannot be combined with any other offer or discount. Choose from the best selection of Red Maples, Oak trees, Palo Verde, Crape Myrtles, Flowering Plums, White Birch, Chinese Elm, Aptos Blue Redwoods, evergreens, citrus and much more! Valid 4/12/19 and 4/13/19 only. 5g Red-tip Photinia (Photinia x fraseri), 5g Waxleaf Privet (Ligustrum japonicum ‘Texanum’) and Indian Hawthorn bushes (Rhaphiolepis sp). Choose from apricots, apples, pears, peaches, cherries and many more. Excludes multi-grafts & grapes.